Hey hey! We are three months already! We are getting in to routine little by little. Eating times, sleeping times are more less regular now. Daniella doesn’t sleep as much during the day, but she is still very good girl. Sitting in her favorite chair and looking around. Daniella still sleeps throughout the whole night. We are so lucky, we didn’t have any sleepless nights with this baby yet..
Our little angel is much more interested in toys. 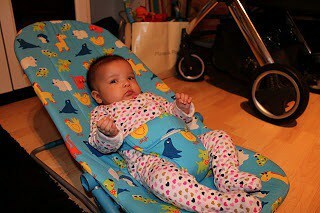 She tries to touch with her little hand or keeps on tapping on a toy in front of her. Awww, Daniella is so cute. Three months already. It goes so quickly, doesn’t it? Next → Next post: Nails – beginning!